I didn't sleep well due to a sore throat. I texted our principal and music director that I wouldn't be able to make it to Mass. I had slept nearly all day Saturday. I was tired. I didn't realize I was coming down with something. I thought I was being lazy! I forced myself to exercise for 45 minutes. I wanted to do an hour or more but couldn't. Now I know why. I made a frittata with mainly egg whites and one whole egg. 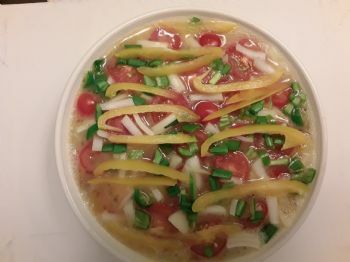 I threw in spiralized yellow squash and zucchini, onion, jalapeno, yellow bell peppers, fresh chives, and tomatoes. 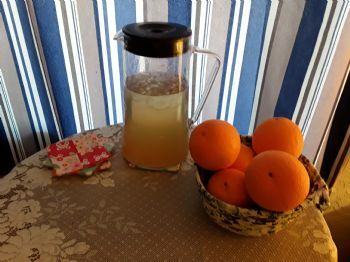 I brewed lemon ginseng iced tea. My friend dropped off freshly picked oranges from their tree. I had some feta cheese in the fridge so I sprinkled that on my serving of frittata. It was delicious. The tea is great and I had one orange which was sweet and juicy. 5 min? Lol! I hope you're feeling better soon. Stunning photos! feel better!! 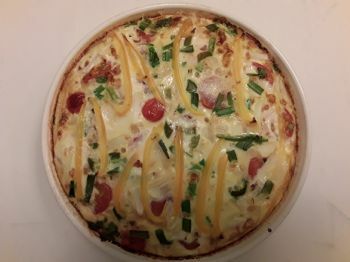 wish i could fit that wonderful looking frittata into my day! !